Here's pert Betty Grable at the peak of her wartime career, singing period songs like Put Your Arms around Me, Honey and Cuddle Up a Little Closer in gloriously garish Technicolor. The plot's a piece of tosh about saloon-keeper George Montgomery wanting to turn Grable into a big star, while rival hotelier Cesar Romero wants her for himself. If the story sounds familiar, that's because it was successfully remade by Twentieth Century-Fox seven years later as Wabash Avenue, also with Grable. 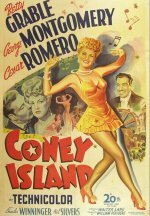 Nevertheless, Coney Island is vastly entertaining in its unsophisticated, mindless way, and it's absolutely typical Betty.